Cracking or creaking noise from the clutch pedal/master cylinder area may be noticed when operating the clutch pedal on 2011 Audi A4, A5, S4 and S5 vehicles. The cause may be the result of an incorrect component. 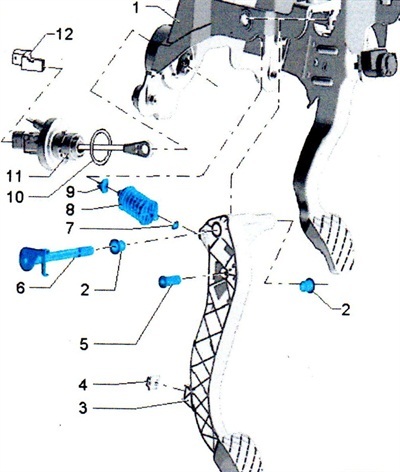 Replace the mounting pin for the clutch master cylinder input rod with P/N WHT 001 666 according to the repair manual. Apply 1g of grease G 052 128A1 on the eye of the master cylinder. Also continuously grease the pin WHT 001 666 in the contact area between the pin and the master cylinder. Make sure that the pin is correctly attached and recheck for proper operation. The pin does not have to be secured by an expanding rivet, even if a rivet was incorrectly fitted by the factory. The clutch master cylinder is not the cause of the complaint. Do not replace the clutch master cylinder. Note the mounting pin (No. 5 in illustration).